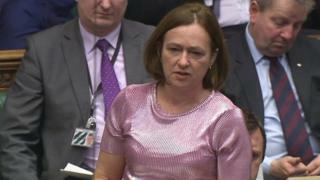 Dwyfor Meirionnydd MP Liz Saville Roberts has been elected Plaid Cymru's leader at Westminster. She succeeds Hywel Williams, the MP for Arfon, who had been in the post for almost two years. Ms Saville Roberts became Plaid's first female MP at the 2015 general election, succeeding party colleague Elfyn Llwyd who stood down after 23 years. Plaid Cymru now have four MPs, after Ben Lake won Ceredigion from the Lib Dems in last week's election.